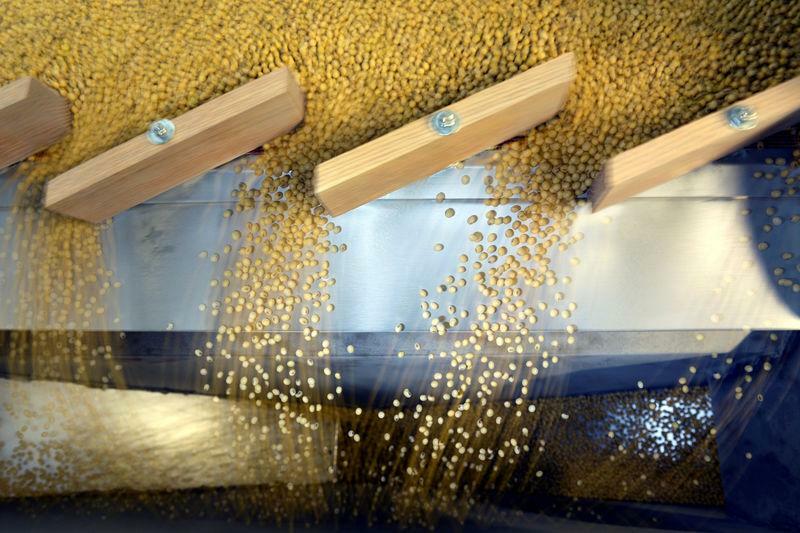 CHICAGO (Reuters) - Escalating tensions between the United States and China have triggered a flurry of U.S. soybean purchases by European buyers, in one of the first signs that trade tariff threats lobbed between the world's top two economies are disrupting global commodity trade flows. News of the sales, confirmed by the U.S. Department of Agriculture on Friday, helped to underpin benchmark Chicago Board of Trade soybean prices <0#S:> after U.S. President Donald Trump threatened to slap tariffs on an additional $100 billion of Chinese goods. The USDA said 458,000 tonnes of U.S. soybeans were sold to undisclosed destinations, which traders and grains analysts said included EU soybean processors such as the Netherlands and Germany. If the entire volume is confirmed to be going to the European Union, it would be the largest one-off sale to the bloc in more than 15 years, according to USDA data. The USDA could not immediately be reached for comment. "We're seeing a realignment of trade," largely because the politics is driving up Brazilian soybean prices, said Jack Scoville, analyst with the Price Futures Group. Traders and analysts said the unusual trade flows were likely to continue in the near term, benefiting U.S. Gulf Coast shippers and likely hurting exporters in the U.S. Pacific Northwest, the No. 2 bulk grain outlet that relies heavily on Chinese demand. Trade tensions between Washington and Beijing have rattled markets over the past week. Soybean prices tumbled by as much as 5 percent after China threatened to levy extra duties on U.S. shipments, though the market ultimately ended the week down about 1 percent. The United States is the second-largest soybean exporter in the world after Brazil. China is by far the top buyer, importing about two-thirds of all soybeans traded globally. The big U.S. soybean sales come at a time when U.S. shipments are traditionally costlier than newly harvested soybeans shipped from Brazil, the world's biggest exporter. But accelerated buying of Brazilian beans by Chinese importers, weary of potentially paying steep tariffs on U.S. purchases, has sent Brazilian export premiums to historic highs. Near-term soybean shipments from Brazil peaked near 200 cents above CBOT May soybean futures (SK8) before pulling back to around 170 cents over by the end of the week, traders said. U.S. Gulf Coast shipments, by comparison, were only around 90 cents a bushel above futures. "The Brazilian beans are likely going to go to China in the short run and the U.S. beans are available. With what's happened to the price spreads, U.S. beans are sort of on sale for these buyers," said Jim Sutter, CEO of the U.S. Soybean Export Council. Some of the sales announced by USDA on Friday were initially booked as Brazilian shipments, but were switched to cheaper U.S. beans when Brazil's prices spiked, traders said. "U.S. prices got exceedingly cheap compared to Brazil," said a U.S. trader who asked not to be named. "Some of this is outright new business. Some of it is arbitraging away from Brazil." The current-season shipments are slated for loading from May to July, they said, typically the height of Brazil's export season and a low point for U.S. shipments. "I think we'll see more (U.S.) selling to some destinations in volumes that we don't ordinarily see, at least in the short term until the Brazilian basis calms down," Scoville said.